Katherine Hill Wingate (ex.1916-1920) studied under Arthur Melville. "She is modern but not too modern and one feels free to discuss the work of Turner, Maris and McTaggart when looking at some of her work" - Glasgow Evening Herald. 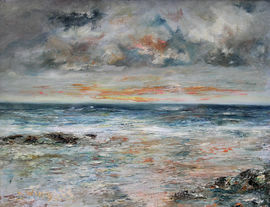 Painted seascapes of Arran and Ayrshire coast.